Over the last three years we (Margie Mayfield, Richard Hobbs and I) have been studying how human activities alter the way natural plant communities form, often leading to novel plant communities comprised of natives and exotics. Fortunately, we have access to a beautiful study system, the York gum woodlands in southwestern Australia. 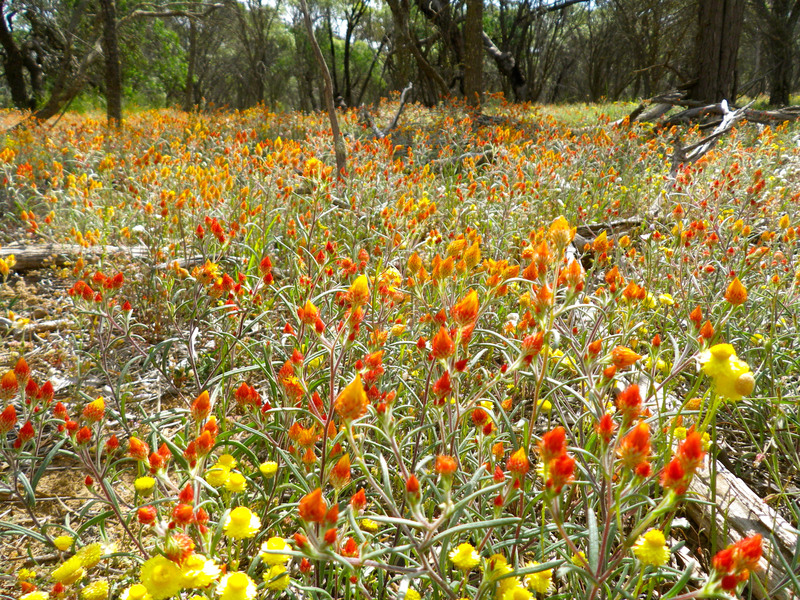 These woodlands support annual wildflowers that form colourful carpets during the winter-spring growing season (see photo). Unfortunately, most of these woodlands have been cleared, and the remaining patches are affected by grazing, fertiliser runoff and biological invasions. Using extensive surveys over multiple years, we investigated how fertiliser and invasive species influence the processes that form these lovely wildflower communities. The first paper from this work just came out in Ecology (http://www.esajournals.org/doi/abs/10.1890/13-0412.1). This paper focuses on an important plant functional trait, Specific Leaf Area (SLA). By quantifying how SLA changes along natural (e.g shade) and human-created (e.g. phosphorus) gradients we were able to gain interesting insights about the processes that form novel plant communities. We also revealed how SLA changes in response to good rainfall years and bad rainfall years, which gives us some important clues about how these communities will respond to ongoing climate change in the region. Stay tuned – more papers on this beautiful ecosystem are in the pipeline. Loy Xingwen has taken some beautiful pictures of these communities, check them out. From: Publications, What's up on the ground!